Rain Barrels Intl - Faq. What are the benefits of a rain barrel? Is rain barrel water drinkable? Can the rain barrel be used in winter? Why does the barrel need to be set on cinder blocks? What is the purpose of the overflow on the side of the barrel? The screen is riveted to the bottom of the lid with steel bolts. To prevent bugs and mosquitoes from getting into the barrel, the edge of the screen are sealed to the lid using silicone. Can rain barrels be connected together? Your rain barrel will harvest oxygenated and chlorine-free water, making it ideal for watering plants. It diverts rain water from the municipal storm drain system, as well as protects our oceans, bays, rivers and streams from runoff pollution. A rain barrel will conserve a vital natural resource while saving its owner’s money on the water bill. 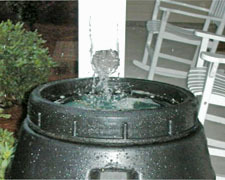 No, water saved by the rain barrel should be used for watering plants or cleaning around your property. Yes, we keep our rain barrels up all year long. However, we cannot guarantee that the faucet will not crack if temperatures drop below freezing. If temperatures do drop below freezing, we recommend a faucet cover to be placed over the faucet to prevent cracking the brass. Gravity flows downhill, so if the barrel is placed higher, the water will drain out faster. Raising the barrel also permits easier attachment of a hose to the faucet and placement of a bucket. In an average rain, the barrel will fill very quickly. The overflow allows a standard garden hose to be connected to the barrel to assist in draining the excess water away from the foundation of your property. It is also easier to place a one-gallon bucket under the faucet. How is the screen attached to the lid? Yes, we suggest you use a ‘Y’ connector to your bottom faucet, cut a garden hose 23 inches long, and attach two female connectors on either side. That way you can screw your cut hose to your ‘Y’ connector and then to a second barrel allowing both barrels to fill up together from the bottom up. When rainwater is directed into a rain barrel, even 1/10 inch of rain can collect up to 55 gallons of water (off of an average 1000 sq. ft roof). We hope that you will also save water in your home. For example; put a bucket in your shower, so while you wait for the water to heat up, you’re not losing the first couple of gallons. Remove the bucket, take your shower and then pour the saved water into your rain barrel. That way you are saving the water which would otherwise be going down your drain while waiting and you can use your rain barrel as a storage unit to save water even when it is not raining! The replacement of your product is guaranteed for 30 days from date of retail purchase with receipt. Damages caused by negligence/abuse are not covered. No warranty on cracked faucets due to freezing. Any water harvested is for non-potable use only. Lids must be closed tightly to avoid danger to children or animals.